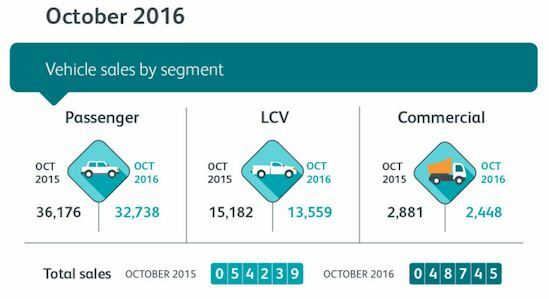 The latest Naamsa figures for October vehicle sales are out and once again the picture is grim. South Africa’s new vehicle sales market continued deteriorating last month - the National Association of Automobile Manufacturers of South Africa show total industry sales of 48 745 new vehicles – a year-on-year decline of 10.1%. Year-to-date, the industry is down 11.2%, with sales of 459 486 new vehicles, compared to 517 152 new vehicles sold for the same period last year. In WesBank's assessment of the figures it found that overall demand has slowed across all vehicle segments, with passenger cars and Light Commercial Vehicles (LCVs) seeing respective year-on-year declines of 9.5% and 10.7%. Sales to rental and fleet companies grew 31.6%, year-on-year, with total sales of 7 042 vehicles. Year-to-date, the rental market has grown 20.5%. Despite this however, rental market growth could not offset losses in the dealer channel, where new passenger car sales fell by 18.3%. This drop in demand at a dealer level correlates with data from WesBank, which shows 15.3% fewer loan applications received for new vehicles during October. According to the lender, affordability remains the main influencing factor for the decline in new vehicle sales and the migration to used. “New car prices have increased above CPI rates, based on the Rand’s weakness over the last two years. In October the average new car financed was 12.7% more expensive than the same period in 2015. Additionally, rising living costs and higher interest rates have placed consumers’ monthly budgets under more pressure,” it said in its analysis.